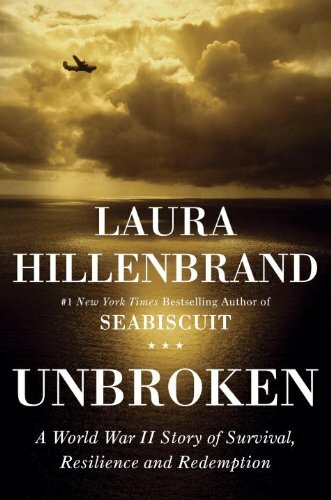 I'm not quite half way through with Unbroken, and the read is a somewhat harrowing experience. The savage cruelties of which humans are capable are unfathomable, and seem to be compounded dramatically in war. It's incredibly uncomfortable, nauseating and even disorienting to read of all the amazingly horrific atrocities these people suffered on a daily basis at the hands of their brutal captors. I know the main 'character' survives, but that knowledge is cold comfort, with another half book's worth of unimaginable suffering to be endured. On the one hand, this man actually endured and lived through all this sadistic brutality; surely I should be ok reading about the experience. On the other, in some ways I just don't want to know. I think this not wanting to know, this fooling oneself into thinking "Well, war's bad, but it's not that bad" is how we seem to fall into war so easily. Yes, it is bad. But it is so much worse than we allow ourselves to think about. It's almost a protective coating we apply to our psyche that disallows us to fully empathize with the radical suffering everyone experienced--continues to experience. Because if we did, if we allowed our minds to go there, we're not sure we'd have the strength or conviction or hope to go on. How these people managed to retain the will to survive still remains inexplicable to me. And yet I will persevere through the story, because, after all, they did. It's really the least we can do, we that have been fortunate enough to remain at a comfortably great distance from such battles and their aftermaths. I'm learning a lot more about the Pacific front of WWII than I ever knew before. Most education about that time period focuses on Europe, the Nazis, and the horrors of the concentration camps. Of course we learn about the atomic bombs that ended the war, but it's never really fully explained why, and why they felt such measures necessary. It's becoming slightly clearer. Apparently such inhumane barbarities were carried out in the eastern hemisphere as well. It really is so much worse than I ever let myself imagine before. We tend to think our imagination can come up with the worst sort of horrors, but yeah, not so much :\ I knew very little about the experiences of Far East POW in WW2 until last year, when I read Julie Summer's Stranger in the House. This is a non-fiction book about what British women felt when the men in their lives (be it husbands, fathers, sons or grandfathers) returned from the war, especially considered that all those years apart had turned both them and these men into different people. The chapter on PoW was heartbreaking. Unsurprisingly, PoW had the most trouble adjusting to everyday life after their harrowing experiences, and many never managed to communicate what they'd endured to their loved ones at all. Stranger in the House sounds like a dead-accurate title for what those women must have experienced, and for what any family with someone who returns from service in a war must experience. They mustn't easily be able to share, b/c to share would be to relive, which I'd think they'd be trying so hard not to do. And no one really wants to know what happened with stark accuracy... not really. I might have to check that book out, although I'll need a break from the uncomfortable subject of war after this.